Easy Fall Centerpiece | hi Sugarplum! The first day of Fall was officially last week, unfortunately Texas is late getting the memo. But even though it’s still 90-degrees and we’re in the pool every weekend, I was itching to start the transition to Fall decor inside. I threw together an easy centerpiece and thought I’d share. 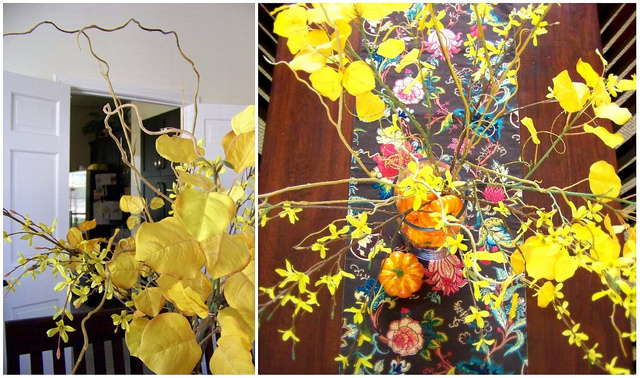 I picked up some new leafy stems from the Fall aisle at Michaels, and added them to my existing yellow flowers from World Market, along with some manzanita-looking branches. I rarely use faux-flowers, but stems tend to look pretty realistic. 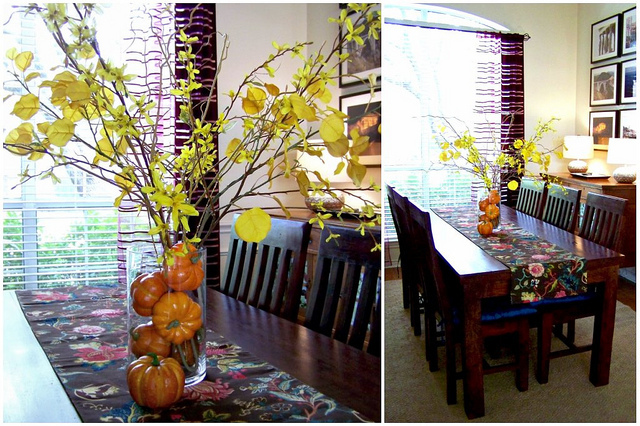 I tied the branches loosely together to help them stand more upright, and filled the glass vase with mini-pumpkins for the added Fall vibe. The ceilings in the Dining Room are really high, so I don’t have to worry about it being too tall. I actually like it looking a little overgrown and unruly, it feels more true to nature that way. And, um, another reason I have so much vertical space is because I had the remodeled chandelier taken down. We were having a ceiling fan installed on the back patio this Summer, and on a whim I had the electrician take down the chandelier so I could paint it again. But that never happened. I think now I’ll wait to decide the chandelier’s fate once I move on to the Dining Room makeover (yep, it’s coming too). So the tall centerpiece is a nice distraction to the obvious void left behind. Thank goodness for Lamp-A-Looza, or the Dining Room would be out of commission every evening. Which would reeeeally please my son who constantly objects to his piano practice. It’s a small change, but it’s a start. Next step is to complete the fireplace/mantel makeover so I can get to decorating it for the season! 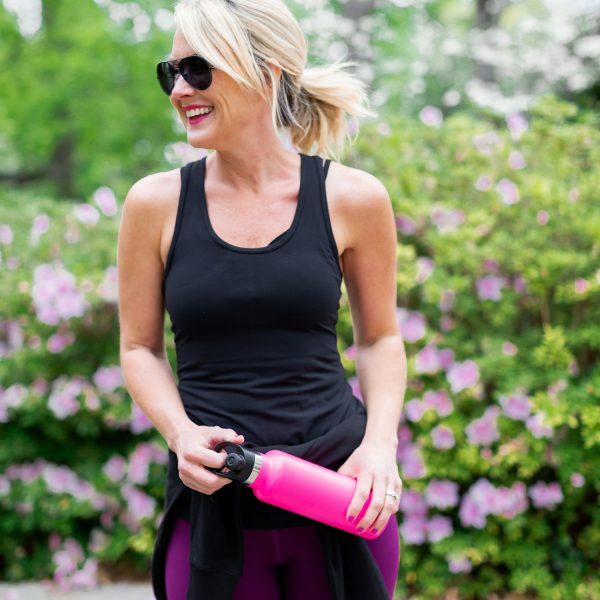 Have you started making cha-cha-cha-cha-changes? Love it! I am sooo behind, haven't changed a thing yet. It's still been hot here too…so not really in the fall mood yet. And, we've been so busy working on the basement and watching volleyball. I wouldn't be in the fall decor mood either if it were still 90 dang degrees outside! It's been cool and rainy here in Kentucky. – And girl it's always cha cha changin' in my house! I feel guilty decorating for fall since its still high 80s low 90s here in colorado as well! I love the simplicity of this but still packs the wow factor in! Hehehe…I skipped the fall and went *straight* to Halloween…Um, obsessed much, Aubrey? (c: Yep…I put it all up about a week ago…isn't that weird?!? 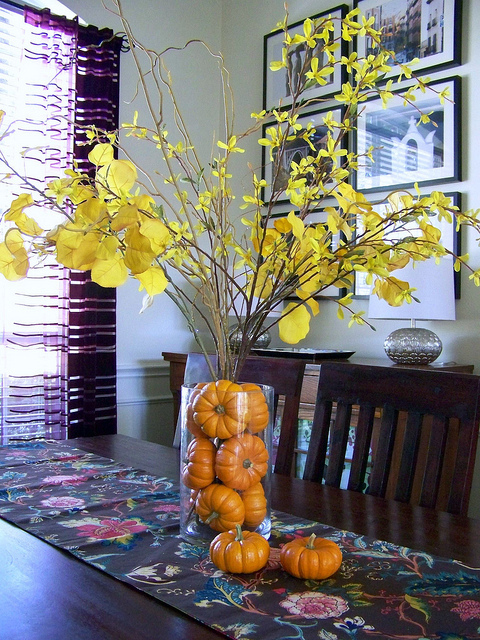 But I'm loving the fall centerpiece…I can't believe those stems are faux! 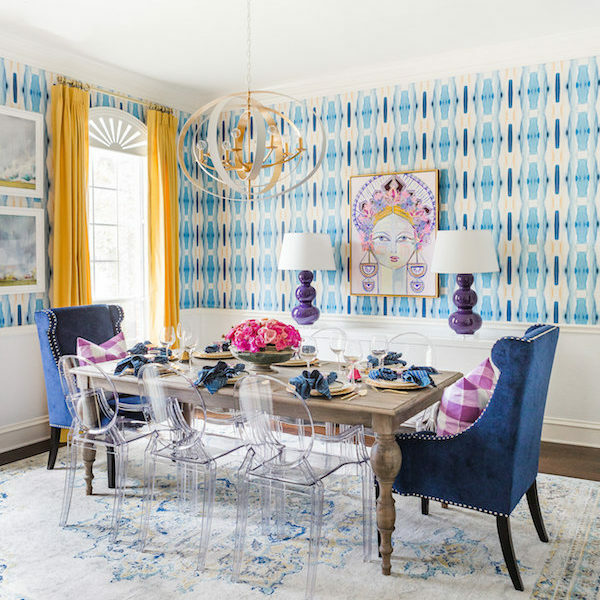 And whatever the fabric is on that runner is absolutely gorgeous, amazing colors! cha-cha-cha-changes. I can't stop singing that now. I love that idea. I am in love with mini pumpkins. So pretty Cassie, love it! Lookin' good sista. I wish you could take a trip to Michael's with me! Beautiful! I need to start decorating for fall now! I still have the same curly willow branches from July on my table – those suckers wont die! Love it! I'm living vicariously through everyone doing their fall decorating – it's still 104F here so I can't seem to get into the fall spirit. Maybe Christmas? I like it! 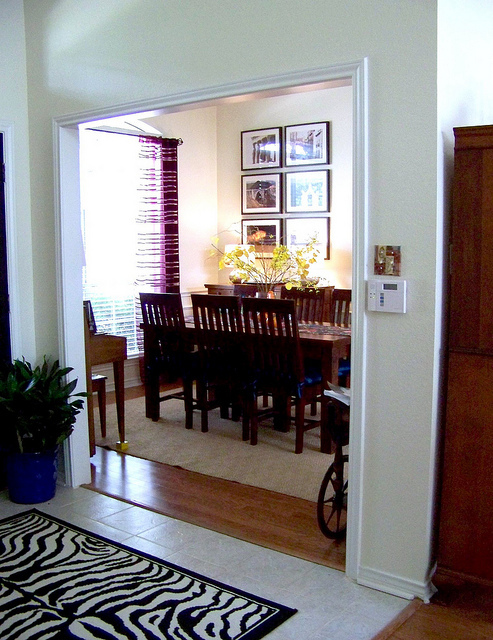 Your dining room looks nice w/o the chandy! 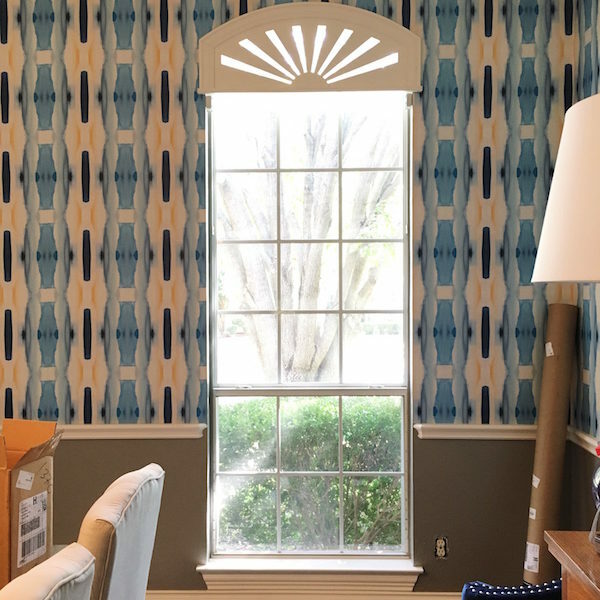 I'm dying to change our dining room chandy out but not sure for what yet and I think my husband will think I'm crazy! 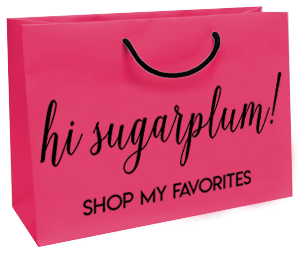 You have a lot going on at Casa Sugarplum! I broke out some of the fall changes in my house already (pretty much involved changing pillowcases on the couch). 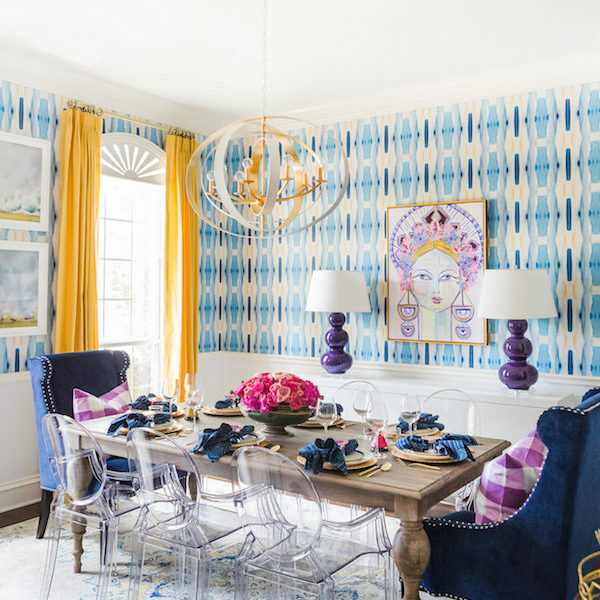 I'm inspired to take the home makeover 1 room at a time. I always would get overwhelmed but you're inspiring me to take it one step at a time to see what the room really needs! Thank you! You are one smart chick! Love it! And that runner is pretty too. 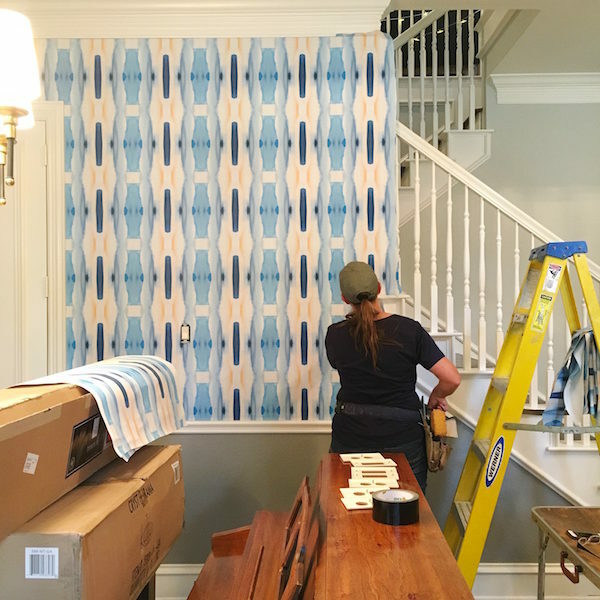 Can't wait to hear about your big plans for the dining room makeover! I stopped at Hob Lob last night for an upcoming Fall project! You are right, so simple and yet elegant and beautiful. 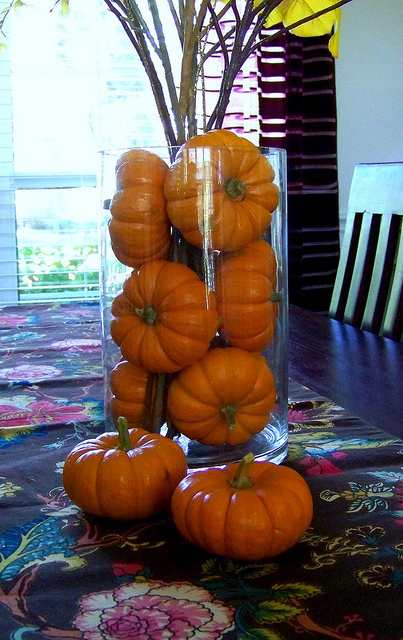 This is a great idea for a fall centerpiece. Thanks for sharing. I put out some fall decor in our living room and kitchen, but I need to do some decorating on our porch. 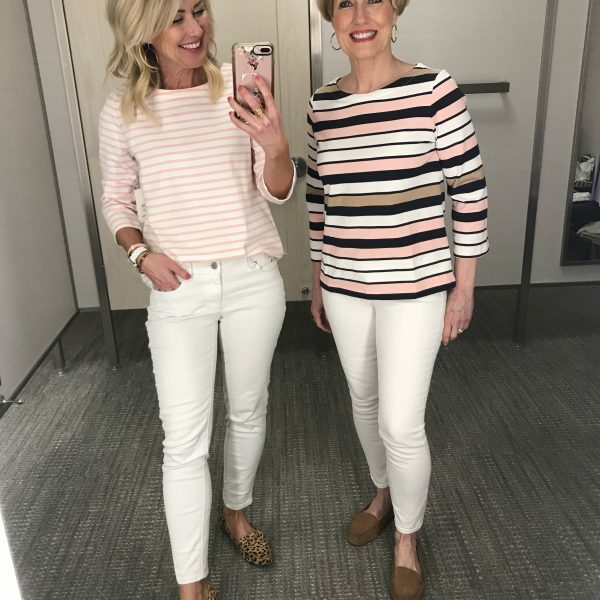 I might have to steal your idea ;0)…and give you credit of course! Cassie it is very elegant yet simple. I love the vertical cylinder with pumpkins and stems! Loved it so much I decided to do it myself!!!! Thanks!! !